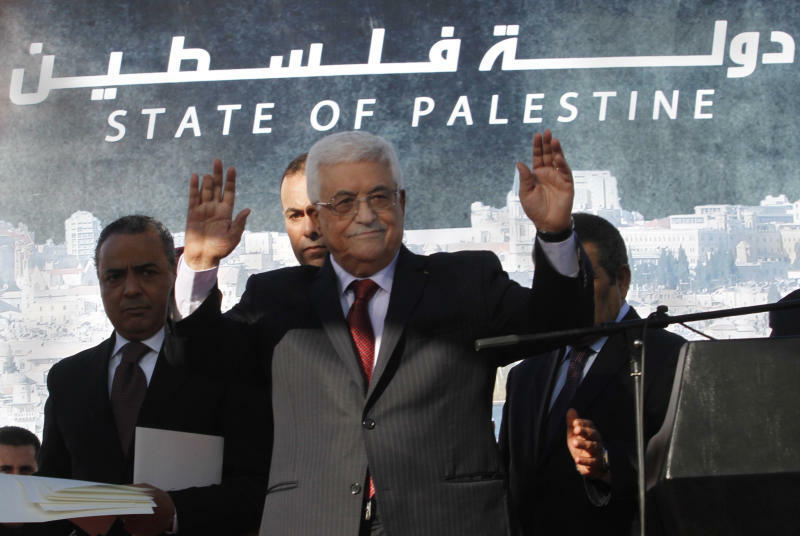 RAMALLAH, West Bank (AP) — With U.N. recognition of a Palestinian state in his pocket, President Mahmoud Abbas wants official documents to carry a new emblem: "State of Palestine." But scrapping the old "Palestinian Authority" logo is as far as Abbas is willing to go in provoking Israel. He is not rushing to change passports and ID cards Palestinians need to pass through Israeli crossings. The very modesty of Abbas' move to change official stationery underscores his limited options so long as Israel remains in charge of territories the world says should one day make up that state. "At the end of the day, the Palestinian Authority won't cause trouble for its people," Nour Odeh, a spokeswoman for Abbas' self-rule government, said of the need for caution. Abbas won overwhelming U.N. General Assembly recognition for a state of Palestine in the West Bank, Gaza and east Jerusalem in late November, a rare diplomatic victory over a sidelined Israel. The U.N. nod was important to the Palestinians because it affirmed the borders of their future state in lands Israel captured in 1967. Recognition, however, has not transformed the day-to-day lives of Palestinians, and some argue that it made things worse. In apparent retaliation for the U.N. bid, Israel in December withheld its monthly $100 million transfer of tax rebates it collects on behalf of the Palestinian Authority, further deepening the Abbas government's financial crisis. Since the U.N. recognition, Abbas has maneuvered between avoiding confrontation with Israel and finding small ways to change the situation on the ground. Last week, his government press office urged journalists to refer to a state of Palestine, instead of the Palestinian Authority, the autonomy government set up two decades ago as part of interim peace deals with Israel. Palestinian diplomatic missions around the world have been told to use the new names, including those in countries that did not vote "yes" at the General Assembly, said Omar Awadallah, a Palestinian Foreign Ministry official. Israeli government spokesman Mark Regev dismissed the name change as pointless but declined comment on whether Israel would retaliate in any way. "Instead of looking for gimmicks, Palestinians should negotiate with Israel to bring about the end of the conflict," he said. "That will lead to a situation of two states for two peoples." Israel objected to Abbas' U.N. bid, accusing him of trying to bypass negotiations with Israel on the terms of statehood. Such talks have been frozen for more than four years because Abbas and Israeli Prime Minister Benjamin Netanyahu disagree on their parameters. Netanyahu says he is willing to cede land to a Palestinian state but will not withdraw to the 1967 lines or give up any part of east Jerusalem, the Palestinians' desired capital. Abbas has said negotiations remain his preferred choice, and that U.N. recognition was meant to improve his leverage with a far more powerful Israel once talks resume. Since the U.N. vote, Abbas has shied away from measures that could close the door to talks by upsetting Israel or the U.S., which also objected to his U.N. bid. Abbas has not taken practical steps toward seeking membership for Palestine in U.N. agencies, something made possible by the November vote, and his security forces continue to coordinate with Israeli troops in tracking Islamic militants in the West Bank. In Washington, State Department spokeswoman Victoria Nuland expressed U.S. opposition to using the term "State of Palestine." "You can't create a state by rhetoric and with labels and names," she told reporters. "You can only create a state, in this context, through bilateral negotiations." Nuland called Abbas' decision "provocative, without changing the condition for the Palestinian people." She said the U.S. peace envoy for the Mideast, David Hale, was headed to the region and would meet the Palestinian leader on Tuesday. Some countries, such as Brazil, Costa Rica, Nicaragua and Honduras, have adopted the new name. Others, like Norway, Sweden and Spain, stick to the Palestinian Authority term even though they supported U.N. recognition. Analysts said Abbas holds out hope that President Barack Obama will get more involved in the Israeli-Palestinian conflict in his second term and — freed from the restraints of seeking re-election — take a tougher stance toward Israel. "He still hopes to resume peace talks in line with U.S. efforts," Palestinian analyst Hani al-Masri said of Abbas. "Therefore, he is making these slight changes because people expect him to make changes after the U.N. recognition." Still, the gap between the symbolic U.N. nod and the reality on the ground remains wide. The Palestinian Authority administers some 38 percent of the West Bank, but Israel maintains overall control over the territory. Abbas has no say in east Jerusalem, annexed by Israel in 1967, or in Gaza, seized by his political rival, the Islamic militant group Hamas, in 2007. The documents and stationery with the new emblem will be ready within two months, said Hassan Alawi, a deputy interior minister in the Palestinian Authority. Israeli officials declined comment Monday on whether Israel would refuse to deal with documents bearing the "State of Palestine" logo. However, Alawi said his office was informed by Israeli officials after Abbas' decree that "they will not deal with any new form of passport or ID." Saeb Erekat, a senior Abbas aide, said the new emblem will be used in correspondence with countries that have recognized a state of Palestine. He suggested that there would be no change in passports or other documents Palestinians need for movement through Israeli crossings. "As far as the Israelis are concerned, we are not going to overload the wagon of our people by putting state of Palestine on passports," he said. "They (Israelis) will not allow them to travel." Palestinians must pass through Israeli-run crossings to leave the West Bank and also carry an ID card at all times or risk arrest if stopped at an Israeli military checkpoint inside the territory. The name change has even less meaning for Palestinians in Hamas-ruled Gaza. Israel withdrew from the coastal strip in 2005 but continues to control access by air, sea and land, with the exception of one Gaza border crossing with Egypt. "For me, it's just ink on paper," said Sharif Hamda, a 44-year-old pharmacist in Gaza City. "I wished they would save the money they will spend on this and use it for helping needy families." Laub reported from Jericho, West Bank. Associated Press writers Ibrahim Barzak in Gaza City, Gaza Strip and Bradley Klapper in Washington contributed reporting.